As a result of the devastating flooding that occurred in 1977, Congress directed the Corps of Engineers in the 1981 Water and Energy Appropriations Act to evaluate the flooding problems in three river basins within the Appalachian region and target flood protection specifically for five major communities within those basins. The Town of Grundy, Virginia, was one of the five named communities. From the early 1980's when the Corps first started evaluating the flooding problem in Grundy until the mid 1980's, the Huntington District worked with the mayor and the town council in evaluating an array of structural alternatives that might address the flooding problem. By structural alternatives we mean those measures such as dams and channel improvements that prevent floodwaters from reaching existing residences and businesses prone to flooding conditions. 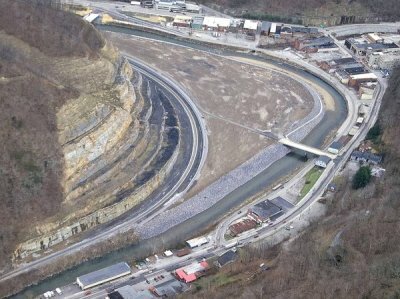 The alternatives evaluated included a reservoir upstream of the town, floodwalls, an open cut channel alternative similar to the Pikeville, Kentucky, Cutoff Project as well as a diversion tunnel designed to provide protection primarily to the Central Business District (CBD) area and a wide array of channel improvement alternatives of various lengths and widths. After more than six years of intense study, it was determined that for several reasons a structural solution to the flooding problem in Grundy was not a feasible alternative. No structural alternative identified provided total protection to the town from a flood equal to the 1977 flood. Each alternative evaluated required the inclusion of extensive nonstructural measures (see below for description of nonstructural alternatives) to provide total protection mandated by the legislation. Each of the alternatives studied imposed significant construction impacts on the very development that it was designed to protect. Each of the structural alternatives imposed significant environmental impacts in the area thereby raising serious concerns from the environmental community. It was determined that the structural alternatives when complemented with the appropriate nonstructural measures required to provide April 1977 level of protection were not affordable to either the federal government or to the town of Grundy. Before 1986, the Corps' flood protection projects received full federal funding. However, with the Water Resources Development Act of 1986, project cost sharing became law. Projects of these types required a non-federal cost sharing sponsor to provide a minimum of 25% to a maximum of 50% of total project cost including a required 5% cash contribution. Recognizing the importance of finding an effective approach to flood protection, the Corps and the town began evaluating nonstructural alternatives. Nonstructural alternatives focus on efforts and measures to reduce flood damages in an area by addressing the development in the floodplain. Alternatives include such measures as floodplain zoning, participating in the National Flood Insurance Program, developing and implementing flood warning systems and emergency evacuation plans and flood proofing individual structures as well as removing structures from the extreme flood hazard areas. To assist the Corps in developing these plans, Grundy appointed a task force comprised of a cross-section of the business community who would work with the Corps in formulating these plans. The task force leader was the late Mr. Ron King, a prominent Grundy attorney. The Corps and the Grundy task force first met in July 1989. During the early stages of planning, it was obvious that implementing a voluntary program of flood proofing and floodplain evacuation such as was underway in several locations in the Tug Fork Basin was feasible for those residences and businesses along the Levisa Fork upstream and downstream of the downtown business district and along Slate Creek. However, it was equally obvious that these alternatives could not be applied to the downtown buildings given the type of structures, their age and common wall construction and the depth of flooding experienced during the 1977 flood. It was apparent that a unique solution not previously used by the Corps was the answer - relocating the business district to an area higher than the 1977 flood, or floodsafe redevelopment. The Corps and task force initially developed two plans that incorporated floodsafe redevelopment for the business district. These plans required the floodsafe reconstruction of the downtown area on floodsafe platforms in essentially the same area in which they currently existed. These plans required careful phasing of demolition and reconstruction in place to minimize the impact on the existing businesses. After carefully reviewing these plans, the Corps and the task force determined that while much less costly than the structural alternatives considered previously, implementation of such a plan in the downtown area was simply not workable given the timing and sequencing required to remove the old structures and replace them with new flood safe structures without severely impacting businesses and day-to-day life. The task force recommended redevelopment in an area adjacent to the downtown area which was then occupied by the P. V. Dennis Elementary and the Grundy Jr. High School. The Corps went back to the drawing board and essentially reevaluated the first two plans incorporating the use of the school site for redevelopment as opposed to rebuilding in place on raised floodsafe platforms. The task force found these two alternative plans to be much more acceptable and offered the opportunity for a smoother transition from the old floodprone development to the new floodsafe redevelopment. The mayor and town council (at the recommendation of the task force) selected Plan 3 as the preferred plan. Voluntary flood proofing/floodplain evacuation for the Slate Creek area and those areas along the Levisa Fork upstream and downstream of the downtown business district. Acquisition of structures along Riverside Drive. Construction of a ringwall to protect the side of town in the vicinity of the courthouse. Floodsafe redevelopment at the site of the P. V. Dennis Elementary and the Grundy Jr. High School. Relocation of the two public schools to a flood safe site. Relocation of the fire station. Development of a flood warning and emergency evacuation plan. Although the town preferred Plan 3, there was one insurmountable obstacle standing in the way of its implementation - the cost-share required by the Water Resources Development Act of 1986. This law required at least 25% cost share requirement by a non-federal sponsor, which equated to nearly $25 million for this project. The required non-federal share was not affordable to the town. During the same timeframe that the Corps and the town were evaluating flood control plans, the Virginia Department of Transportation (VDOT) was evaluating alternative alignments for improvement of U. S. 460 in the Grundy area. Prior to this point the Corps and VDOT compared plans and status of efforts, but no connection was made to the potential compatibility of the two projects since the Corps was pursuing a flood control plan for the town, and VDOT had an approved by-pass around the town for improvement of U. S. 460. However, at the encouragement of then State Delegate Don McGlothlin and U.S. Congressman Rick Boucher, the Corps and VDOT explored potential benefits that might be derived from a joint project. After numerous coordination meetings between the Corps, VDOT and the task force, the potential was evident that the Corps and VDOT could save money by combining projects and at the same time meet the non-federal cost sharing requirements of the town at no cost to the town. The joint project consisted of the Corps' flood control project combined with VDOT's improvement of U. S. 460 through the town rather than bypassing the town. The joint project reduced costs for both the Corps and VDOT. By VDOT receiving credit for the acquisition of lands needed for highway improvement common to the joint flood control project, the non-federal cost sharing requirement of 25% of total project costs would be met by VDOT. This plan was known as plan 3A. Plan 3A was authorized for implementation by Congress in Water Resources Development Act of 1996 at the request of Congressman Boucher and concurrence by the town. Subsequent to the authorization of Plan 3A for implementation, the task force, the Corps and VDOT have worked to fine tune this plan to minimize the impact of the improvement of U. S. 460 through Grundy on the existing town. The Corps also had to identify an alternative floodsafe redevelopment site, since the previously selected site is the home for the Appalachian School of Law. As a result, the Corps with the assistance of the task force identified the depot site as a suitable alternative floodsafe redevelopment site. U.S. Rep. Rick Boucher (D-Va.) took up the town's cause in 1997 and hashed out a plan for Grundy's rebirth among town leaders, the Corps of Engineers and VDOT, which had long sought to widen Route 460 to four lanes through the area. With a $96 million budget -- virtually the same amount as the state's share of a Capital Beltway widening project -- VDOT bought the old Lynwood Theater, Jackson Hardware, the Ben Franklin Five-and-Dime Store and a few-dozen other red-brick storehouses of nostalgia in downtown Grundy, much of which had been boarded up long ago. The 1930s-era structures were razed last summer to make room for the roadway VDOT will build along a levy designed to protect what's left of the old downtown and the historic Buchanan County Courthouse. Across the river, the Corps of Engineers spent four years and nearly $100 million to reroute railroad tracks and remove 2.4 million cubic yards of rock -- enough to cover 68 football fields with 20 feet of debris.